If you're looking for something different, but not radical, the Espirt 3 is the answer. A classic in the making? Original but classic design. Well built. Versatile range of Gibson-meets-Strat sounds. Put a Gibson Firebird, Explorer and a Fender Jazzmaster into a mixing bowl and you'd probably end up with the Esprit. It's the only truly original design in the Fret-King Blue Label range - the other guitars are much more obviously inspired-by designs - and of all the models it remains, as Wilkinson said on its inception back in 1998, a "vibe" guitar. It's also, like a Firebird, a cumbersome beast: a stage guitar not an in front of the TV noodler. 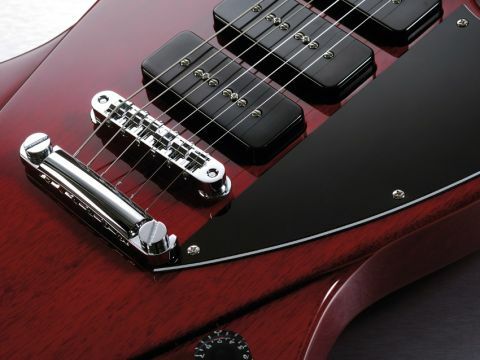 Despite its heavy weight, it's actually more compact than a Firebird - the upper horns reminiscent of a Jazzmaster, the lower bouts more compact, curved Explorer. The Firebird vibe comes from the raised centre section - though here it's tapered rather than parallel - and results in an overall body depth of approx 45mm in the centre and 40mm at the edge. As with Gibson's classic shapes we have a 'slab' body with no comfort contours but a generous vintage-style edge radius. Unlike a Firebird it's a standard set-neck construction and the body is made from three pieces of African mahogany - the centre section approximately 100mm wide. The neck, again mahogany, has a chunky substantial profile that shouts old Gibson, as does the scale length and fingerboard radius. One thing these Fret-Kings don't bother with is unnecessary decoration. There's no fingerboard binding and the inlays are just understated pearl dots with clearly visible pearloid side dots. The medium jumbo gauge fretwire (which is approximately 2.7mm wide, 1.4mm high) is very nicely installed and finished, as is the friction-reducing nut, and overall the detailing is sharp while the cherry finish, not overly thick, is really quite classic Gibson. A black-faced, back-angled and reversed six-in-a-line headstock also looks like it could have come out of Kalamazoo in the fifties or sixties with its Epiphone-like 'batwing' edge but it's actually much more compact than, for example, a Firebird's head. Hardware across all the range is top-notch Japanese-made Gotoh - here the tune-o-matic bridge and stud tailpiece is simple, classic and well tested. Likewise the pickups and electronics: three P-90s controlled by a master volume and tone and a Strat-like five-way selector nicely positioned on the lower horn's inverted scratchplate. The first thing you notice, despite it being weighty, is that this one isn't neck heavy. The neck feels long, but little different from an SG and not as ungainly as a Firebird. Within minutes we've adjusted and are rewarded with some smooth, medium output, modern P-90 tones that can be described tonally as between a medium output humbucker and lower output single-coil: bright-edged but not thin, substantial but not thick or muddy. The bulk of wood here undoubtedly contributes to an almost single-cut like girth, and dial in a seventies-era classic rock amp tone and the back pickup alone nails a beautiful soupy grind. The neck pickup adds some 'flute', especially effective with a gain boost, while the middle pickup nails a tough Texas blues attack. Trying to pigeonhole this one stylistically is hard. With cleaner amp tones it's strum-friendly, especially with those darker, slightly narrower-than-Strat, hum-cancelling, mixed positions (that also work on a crunchier amp tone - just turn down the guitar volume and you can do a passable Strat-y intro), yet change your playing style and there are some old-style blues sounds that are perfect too for edgier pop and Americana. There's not really enough push from the guitar alone for heavier gained riffage, but kick in a stompbox and again you'll be surprised how far you can push it. Overall it feels good, stays in-tune, the controls work properly with good 'woman' tone potential from the tone control. Damn close to perfect for those with open ears, and of course, eyes. The Esprit is a simply excellent design and in this surprisingly Strat-y '3' version could find a place for all sorts of styles. It's rootsy and rocky and there's little doubt you'll be noticed.